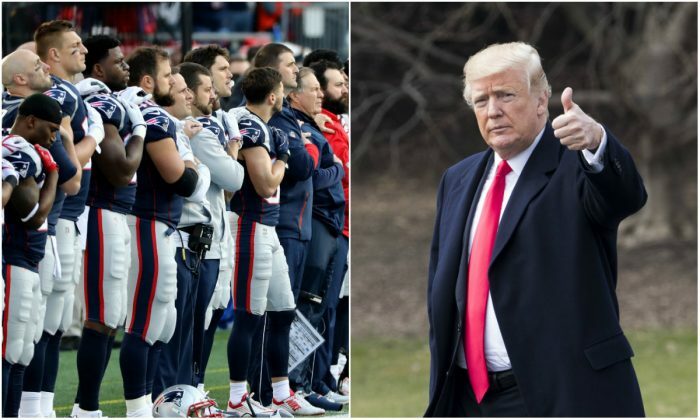 President Donald Trump praised the decision of NFL club owners to require their players to stand while on the field during the national anthem. “I think it’s good. You have to stand proudly for the national anthem or you shouldn’t be playing, you shouldn’t be there. Maybe you shouldn’t be in the country,” Trump told Fox and Friends on Thursday, May 24, morning. The NFL changed its policies regarding the national anthem on Wednesday. “I think that’s good. I don’t think people should be staying in locker rooms but still, I think it’s good,” Trump said. The discussion about the national anthem began with then-NFL player Colin Kaepernick in 2016 as he started to kneel in protest before games while the anthem was playing. Some other players followed suit. Trump criticized the players for choosing a form of protest that’s disrespectful to the country. He even suggested the players should be fired. Meanwhile, NFL ratings dropped by about 10 percent last year—worse than the 8 percent drop the year before, Sports Illustrated reported. Trump said he didn’t believe he was the major force behind the NFL policy change. “I think the people pushed it forward. This was not me. I brought it out. I think the people pushed it forward,” he said. Kaepernick said his protest was over the plight of minority communities. He blamed racism. The league decided to address the issue by creating a program to help the communities that the players feel are in need. Whatever the players donate, the clubs match. Together, they will decide how to use the money. ESPN reported that the funds amount to $89 million. “We’re proud of that support and we think that that’s how change is really going to be made,” Goodell said during a Wednesday press conference. The players union said that it hasn’t been consulted on the policy change. “Our union will review the new ‘policy’ and challenge any aspect of it that is inconsistent with the collective bargaining agreement,” it said in a Wednesday statement.